Things usually don’t end well when LeBron James steps foot in Capital One Arena. But Washington limited James to just 13 points and flipped the script as they ran the Lakers off the court, 128-110 on Sunday evening. John Wall led the way for Washington with a season-high 40 points for a shorthanded Wizards team playing without Otto Porter Jr. for the third straight game and the newest member of the Wizards, Trevor Ariza, who had to sit this one out while this weekend’s trade waits to be approved. Bradley Beal scored 25 points, the eighth straight time he’s eclipsed the 20-point mark and Jeff Green and Sam Dekker added 20 a piece for a Wizards squad that teased us for a night, showing us what this team could look like when it is clicking on all cylinders. Washington stormed out in this one on a 24-8 run over the first five minutes of the game forcing Luke Walton to burn two early timeouts. The Wizards were on fire as they connected on their first five field goals and 12 of their first 17. But after nine brilliant minutes of basketball, the Wizards were a bit too loosey-goosey to close the quarter as the Lakers used a 13-5 run to cut the Wizards lead to 10, 33-23 after one quarter. Things really opened up for Washington in the second quarter as they were able to push the pace. The Wizards used to pride themselves on getting out in transition but that hasn’t been the case this season. Tonight, the Wizards looked like their old selves as they relentlessly pushed the ball, especially on live ball Laker turnovers which allowed them to take control of the game midway through the second quarter. With just seconds remaining in the first half, Wall hit an arcing jumper over Tyson Chandler to give the Wizards a 71-51 lead going into halftime. Washington’s lead ballooned to 27 points at one point in the second half and the Wizards barely had to break a sweat as the Lakers never came within striking distance. Capital One Arena was filled with many purple and gold uniforms hoping to see a big game from James but they were silenced as Wall that stole the show. John Wall turned in by far his best performance of the season with 40 points, 14 assists, and 6 rebounds, with most his damage coming in the first half. Wall came out like a man on a mission early on as he pushed the ball in transition and fearlessly attacked the rim, very reminiscent of the 2016-2017 version of John Wall who made an All-NBA team. The biggest difference from Wall tonight came on the defensive end and that set the tone for the rest of the team. Wall was much more energetic both on the perimeter and when LeBron tried backing him down in the post? He didn’t back down from the challenge. Wall snagged three steals and had two emphatic blocks making everyone wonder, where is this defensive effort on a nightly basis? Offensively, Wall was equally as impressive too. Tonight was one of those nights where guys had to keep their heads on a swivel because if you were open, John Wall was finding you. On the heels of a trade, shipping Kelly Oubre Jr. and Austin Rivers out to Phoenix just one day ago, it was unclear how the Wizards would come out to start this game. However, all of those questions would be put to rest early on in arguably the Wizards best half of the season. Washington stormed out of the gate for a double-digit lead just minutes into the ballgame. The Wizards connected on their first five field goals and 12-of-17 overall and if they would have been able to knock down some of their open three-pointers, the first half could have been even more lopsided. Washington came out with an energy and sense of urgency that we’ve seldom seen this season. Guys were active defensively evidenced as they logged eight steals in the first half and turned 14 Lakers turnovers into 17 first-half points. The Wizards dropped 71 points and were up 20 at halftime which begs the question, why can’t Washington bring this kind of energy in, heck, 75 percent of their games? He’s only played in four games for Washington, but tonight, Dekker showed that he has the potential to be a rotation player for this team. Dekker, who saw more minutes due to the absence of Porter, Ariza, and Kelly Oubre Jr., but also got more playing time as Markieff Morris caught an elbow in the first half to the head and missed the remainder of the game. Dekker scored 20 points on an efficient 10-15 shooting to go along with five rebounds and four assists. Most thought the trade for Dekker was just a cash-saving move and that he’d rarely see the floor. This game might have folks thinking a little bit differently. Sometimes you just have to tip your cap. Kyrie Irving scored a game-high 38 points with none bigger than a deep three-pointer in overtime with just seconds remaining to put the Celtics up for good as Boston drops Washington, 130-125. 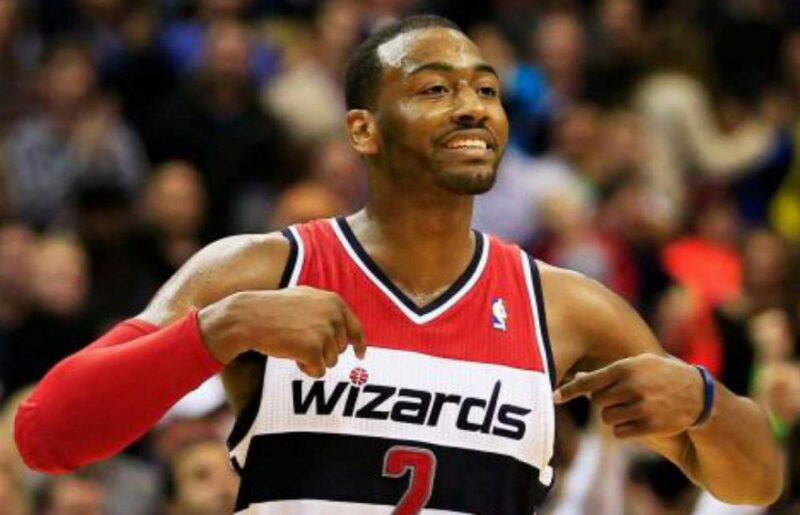 In what turned out to be a vintage John Wall game, Wall flirted with a triple-double as he dropped 34 points to go along with 13 assists and 6 rebounds. Kelly Oubre continued his hot December with 20 points off the bench while Bradley Beal and Jeff Green added 22 a piece but it wouldn’t be enough to overcome Boston’s late-game execution down the stretch. After getting outscored 38-22 in the third quarter and trailing 84-77, it looked like Washington was toast. But that’s when John Wall and the Wizards woke up. Washington opened the fourth quarter on an 8-0 run to regain the lead 85-84 in the blink of an eye. Wall re-entered the game and asserted himself right away with a lob to Thomas Bryant for the dunk bringing a buzz to Capital One Arena. And that’s when the point guard duel began. John Wall and Kyrie Irving have had many epic battles in the past and the only difference this time was that Irving was wearing a Celtics jersey. Whenever Irving and the Celtics scored, Wall answered with a bucket of his own. Wall was relentless in attacking the rim in the fourth quarter as he got to the hole with ease. With just 13 seconds remaining and the Wizards looking dead in the water, Bradley Beal went to the free-throw line. He made the first free-throw to cut the lead to two, 113-111. He missed his second free-throw but miraculously, it bounced right to him as he laid it in for a layup to tie the ballgame at 113 as we’d be heading to overtime. Let's dance in OT, shall we? The Celtics out-hustled the Wizards on the offensive glass to start the overtime period resulting in easy putback attempts and regaining the lead, 118-114. But just like in regulation, Wall continued to attack the hole and finish. There was a scary sequence for Wall when he drove through the lane and got tangled up with Irving resulting in him landing awkwardly. After a quick breather, Wall would re-enter the game. With the Wizards up 123-122, Wall crowded Irving on the wing but Kyrie pulled up for a three as Boston regained the lead, 125-123. Next time down with the game tied at 125, Kyrie would splash in a three from Montgomery County for the dagger putting Boston up for good. Boston wins an overtime thriller, 130-125. Six Wizards players score in double-figures, led by Bradley Beal with a season-high 36 as the Wizards took down the Hawks on Wednesday evening, 131-117. Otto Porter scored 20 and Kelly Oubre added 19 points off the bench for a short-handed Wizards squad that was without the services of John Wall (personal reasons) and Jeff Green (sore back) in Atlanta. After a lackluster start to the game, the Wizards found their footing once they made the decision to lock in defensively. After getting crushed on the glass 11-5 to start this one, Washington ramped up the intensity and took the lead midway through the first quarter. A Thomas Bryant putback dunk followed by a couple of offensive rebounds to keep possessions alive got the Wizards going in this one. Troy Brown Jr. got some first quarter playing time as a result of the team’s depth issues and took advantage of it early. Beal drove baseline and found the rookie for a floater in the lane for his first basket. A couple of possessions later, Brown returned the favor by gathering an offensive rebound and kicking it to Beal for a three-pointer as the Wizards took an eight point lead after one. The Wizards opened this one up in the second quarter thanks to their bench. Kelly Oubre Jr.brought instant energy off the bench, scoring 12 points in the second quarter as Washington’s lead ballooned to 23 heading into halftime. It was arguably their best defensive half of the season and it was one of their best on the offensive end as well, as they assisted on 17 of their 24 made baskets. After a stellar defensive performance in the first half, Washington turned in a clunker in the third quarter. They gave up 45 points in the period, which allowed Atlanta to get right back in the game. Two sloppy plays by Markieff Morris near the end of the quarter allowed the Hawks to get what was a 25-point lead back down to single digits heading into the fourth quarter. With the Wizards lead trimmed down to five, 105-100 with ten minutes left, Tomas Satoranskycame up with a big three-pointer in transition that shifted the momentum back in Washington’s favor. The Wizards were able to take back control after that three and cruise to their third straight win, and ninth win in their last 14 games. It’s really hard to score a quiet 36 points but Bradley Beal did it in this game. He was clearly the best player on the floor this evening and he played like it, scoring a season-high 36 points this evening and dishing out a team-high nine assists for Washington. He was outstanding early on slicing his way to the basket and taking his man off the dribble for some close-in shots, leading the Wizards with 21 points at halftime. Whenever the Wizards needed a basket in the second half once things were a little close for comfort, Beal stepped up to the plate. Whether it was a floater in the lane or a three-pointer from the wing, he gave the Wizards just what they needed to keep the Hawks at bay. He channeled the best parts of how he played during the ‘Everyone Eats’ phase last season to help Washington overcome John Wall’s absence. With John Wall sitting this one out due to personal reasons, that opened the door for Tomas Satoransky to run the show at point. He was outstanding tonight with 14 points on 5-7 shooting and knocked down some timely three-pointers in the fourth quarter when Atlanta clawed back within striking distance. Scoring aside, he pitched a near-perfect game everywhere else. He led the charge defensively for Washington, forcing two steals and dished out seven assists without committing a turnover. Kelly Oubre has been frustratingly up-and-down all season and tonight, he continued one of his odd trends – he’s playing much better on the road than at home. After a 21-point night against the Knicks on Monday, he followed it up with 19 points and 5 rebounds in Atlanta. Unlike Monday where he caught fire from deep, he did most of his damage in the paint against Atlanta, attacking the hole and getting to the line. He pushed the ball in transition for some easy shots and helped facilitate some ball movement in transition to set up Otto Porter for this layup. Let’s not get ahead of ourselves here; the Hawks are a lottery-bound basketball team. But, these were the kinds of games that Washington lost countless times last year. They’ve held serve recently against bottom-feeders like the Nets, Knicks, and Hawks. They’ll get another chance in a winnable game on Saturday as they take on the Cavaliers in Cleveland.